When we look backwards these transitions seem obvious. In fact you might conclude that they were destined to occur by the nature of changing technology, customer preferences and industry forces. This type of thinking, called deterministic thinking, can be very dangerous to the health of your business. Deterministic thinking presumes that you do not have a choice when in comes to market changes. However, the reality of business is that you do have many choices that you can consider when it comes to your business strategy. The future that you create will largely depend on how vigilant and ambitious you are today. Vigilance requires you to understand and address shifts in technology, consumer preferences, and industry dynamics so that you can create alternate strategies and business models to stimulate new demand and buyer value. 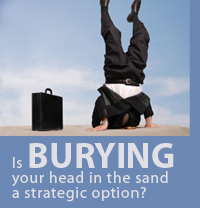 The failure to think about your business future can be very hazardous to your business health. Motorola is a good example of this. They have been displaced by Nokia in the cell phone market by not trying to create the digital cell phone in the late 1990s. So what are your choices for your business' future? While you might be tempted to bury your head in the sand to avoid thinking about this, we would recommend a more deliberate approach. Value Innovation Associates can help you to raise your strategic vigilance and face the strategic uncertainties that exist in your market with confidence. Our Six Path Market Scan Workshops and Day In The Life Of workshops can help you to raise your strategic vigilance and explore alternative future strategic growth options to face the uncertain future with confidence. Please contact us for more information.